FIGURE 4.2 Hydraulic conductance of a "reference network" consisting of three ranks of bifurcating branches of fixed lengths vascularized by a conduit network of fixed volume and conduit furcation number (F). The distal-most branches contained a single conduit each — the minimum required to vascularize the network. For simplicity of calculation, the conduit radii were assumed constant within each branch level and to taper by a fixed percentage across branch levels. (A) Hydraulic conductance vs. the sum of the conduit radii to the third power across branch ranks (shown as distal 2r3/proximal 2r3). The Ir3 ratio was altered by varying the percentage of conduit taper across branch ranks (F held constant). Conductance is shown relative to its maximum when the Ir3 is conserved across branch ranks according to Murray's law. This result is independent of the choice of F (B) The hydraulic conductance of the reference network as a function of conduit furcation number (F). 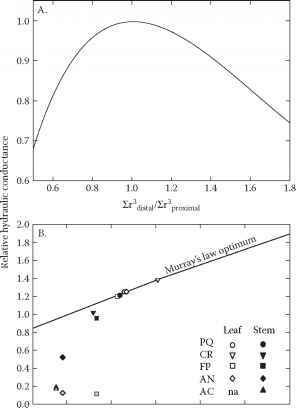 Conductances are shown relative to the Murray optimum at F = 1. The solid "Murray's law optimum" line shows how conductance increases with F. Symbols defined in the legend are network conductances calculated for mean F and Ir3 measurements from Figure 4.4. Species abbreviations: PQ = Parthenocissus quinquefolia (vine), CR = Campsis radicans (vine), FP = Fraxinus pensyl-vanica (ring-porous), AN = Acer negundo (diffuse-porous), and AC = Abies concolor (conifer). The gray symbols show the conductance of the three tree species when standardized by the entire wood cross-sectional area as opposed to just the conducting area. Figure modified from McCulloh, K.A. et al., Nature, 421, 939, 2003.
end walls means the hydraulic conductivity of xylem conduits is significantly below the value predicted by the Hagen-Poiseuille equation for open tubes . The Murray's law derivation still holds, however, as long as the actual conductivity is proportional to the Hagen-Poiseuille value within a given network — this simply adds a proportionality constant to Equation 4.2. Recent work indicates that end walls contribute approximately half of the total resistance across a wide range of conduit sizes . Flow in xylem under physiological pressures is laminar, so except for deviations from cylindrical geometry, the Hagen-Poiseuille equation accurately predicts conductivity . In animals, the volume of the circulating blood is a major cost of transport. In plants, the xylem water is cheap and its volume is presumably irrelevant as a cost of the vascular system. Instead, the analogous cost in plants is the construction of the relatively thick conduit walls. 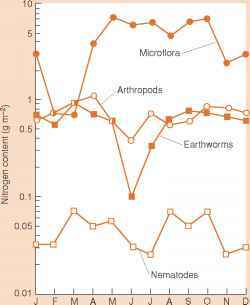 Xylem sap is under significant negative pressures of 1 to 10 MPa, depending on the species and habitat . Avoiding implosion of the conduits requires thick secondary walls stiffened with lignin . Mechanics predict that the wall thickness be proportional to the lumen diameter to maintain a given safety margin against collapse at a given minimum negative pressure. Measurements confirm this prediction, showing that the wall thickness per lumen width scales with the cavitation pressure — the minimum negative pressure the xylem can withstand without breakage of water columns by vapor nucleation . The Murray's law derivation is still valid as long as the wall thickness is proportional to the inner radius of the conduit as expected for a given cavitation pressure. This requires modification of Equation 4.1 but not the dependence of wall volume (hence cost) on r2 on which the derivation depends. Murray's Law may not necessarily hold if conduit walls perform any additional function other than transporting water. In some plants — conifers being the best example — conduit walls perform "double duty" by supporting the plant as well as transporting water. In these cases, wall volume cannot be viewed solely as a cost of transport and Equations 4.1 and 4.2 do not capture the intended conflict between conductivity and cost of investment.